If there's one thing the entire WoW community can agree on it's that the Azerite Armor system has been a complete and utter failure. What was supposed to be a system that allowed players to farm the gear they wanted turned into a RNG hell. What was supposed to be a system that made gear more available made gear more inaccessible than ever. What was supposed to be a system that made off-specs more friendly turned into a system that was just as unfriendly to off-specs as anything else, to the point where it's faster to make a new character than to gear up an off-spec. Here are some of the proposed changes to the game, and some of Blizzard's mindset. This reinforces my strong and long-held belief that players need fewer options. When you give players a massive number of options, you may think the intuitive response they'll have is that they now have so many great options. In reality, there always ends up being a good, better, and best -- even a bad, horrible and worst. Adding more gear means there are more options to get the gear you don't want. We've also seen a huge problem with stat complexity and having to 'sim' your stats to make any sense of whether an item is an upgrade. Less, simpler gear doesn't have that problem. When there are fewer, clearer items then you can also camp them. In EverQuest I almost always wanted the Golden Efreeti Boots on every caster. That was a clear item to go for. You knew exactly where to get them, where to camp, what to kill, etc. The stats on those boots were always the same. They couldn't titanforge or warforge to randomly have better stats or be a higher level version of that item. They were clearly that same item every time. I'm not sure Blizzard gets this. They're adding more traits. They're making the armor more accessible. They're not simplifying. I think the system will go down as the worst gearing in WoW's history, and all we can hope for is that they'll do away with it when it's time for a new expansion. I think it would’ve been best if they had just went a Trails in the Sky/Path of Exile/Diablo system where you just straight up socket powers into slots (be it slots attached to a menu like the current WPvP talents or attached to your equipment like armor). Rather than creating a bunch of powers that boil down to “this ability has a chance to deal x more damage”, create meaningful powers that change up how you play your class, as using abilities in different ways or changing the order of your rotation. Finally, make it so that you can earn the power you want through a 100% guaranteed way (usually through a hard challenge, such as defeating a dungeon boss on mythic+ or a reputation quest that unlocks at exalted that lets you fight a challenging mob, rather than just doing a bunch of activities for a chance to get a power that may or may not be the one you want. That way, you can still have the activity of earning powers in between raid sessions of raising your ilevel. I feel like giving people more or less options is a damned if you do, damned if you don’t kind of thing. Look at talents in wow, have a load of them like in the old days, and people complained about needlessly complicated. Lower the amount and people complain about dumbing down. No matter which system was implemented, people also complain(ed) about lack of meaningful choice, cookiecutter builds and need to sim. It is just a whole clutter of whining no matter what, and it is so difficult to tell when people complain more. Regarding Azurite, more options to get them would be nice, but I am not very fussed, because I always saw it as a replacement of raid sets, and since those only drop in raids, azurite dropping in raids does not terribly bother me. But I think mostly it is because I am not that fussed about gear in general. Personally I like the current talent system, and would be quite happy with 3-4 different traits per ring. Parts of the GCD changes bother me massively more. It’s baffling how much worse the Heart of Azeroth/Azerite armor is compared to Legion’s artifacts and legendaries. They somehow managed to keep all the worst things about those systems and scrap the best parts. Artifacts could be a pain sometimes. You had to grind AP for each spec, which was especially difficult at the beginning of the expansion. But in exchange you got an awesome weapon with some genuinely good abilities. Not just power boosts, but fun, flavour-filled stuff like the trait removing fall damage for subtlety rogues. Mostly importantly, you always got more powerful. Each trait you unlocked made you better than before. You also had lots of great lore and story content related to each artifact. As for legendaries in Legion… yes, some were better than others for certain content, but that wasn’t the problem. The problem was how to acquire them. It was completely random, and luck was your only way to get the abilities you needed. So this leads us to BfA. No real lore like artifacts. Most traits are boring and passive, almost all interesting abilities from artifacts & legendaries have been removed from the game. The AP grind is back, but instead of continual improvement our traits are taken from us with every gear “upgrade”, forced to unlock them again and again. Instead of needing to maintain one weapon per spec, we now need to maintain weapons, headpiece, chest, and shoulders per spec (and often trinkets). And how do you get all this stuff? Random drops, of course. Everything is random, luck based, and rare, just like everyone hated about legendaries. 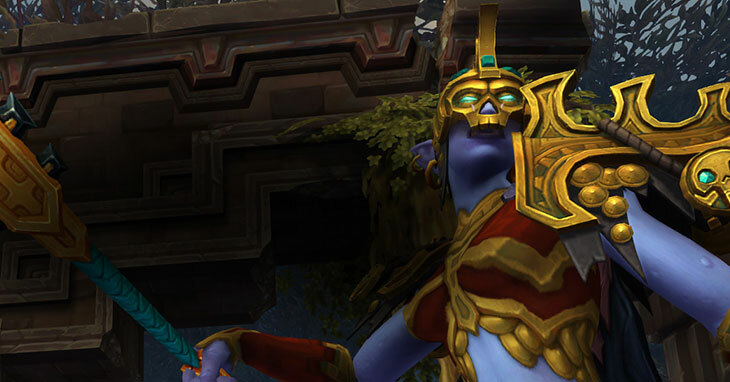 Good luck getting the Azerite piece you want from that cache – you needed the chest, but you’ll get the shoulders. Assuming you get the right slot, good luck getting the traits you actually need. Be sure to hang onto all the gear though – balance changes mean that your best traits can become your worst overnight. I guarantee internally at Blizzard they already know the entire system will be scrapped for 9.0. They’re just not willing to admit it to the public, feeling like they have no choice but to power through BfA with what they’ve got.